Heartland International Film Festival: Audience Choice Award; Toronto Film Festival nomination: Audience Choice Award; Philadelphia Film Festival nomination: Best First Feature. One other win, 3 other nominations. The subject of memory loss has been tackled before in such acclaimed films as “Still Alice” and “Away from Her” (both NOSFA films). But director Elizabeth Chomko, drawing from the lives of her own grandparents, creates authenticity within what would otherwise be a familiar domestic dynamic. This is a family that shouts together, that leaves bruises, that cackles at things that would crush others. 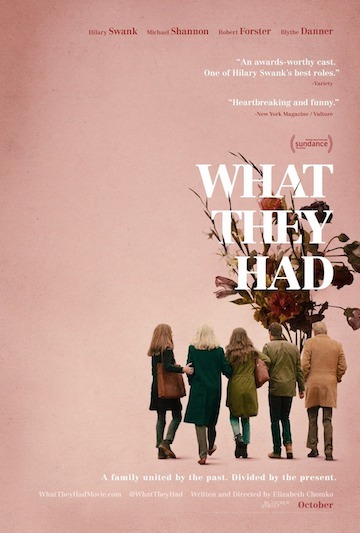 “What They Had” follows siblings Bridget (Hilary Swank) and Nicky (Michael Shannon) as they come together after their Alzheimer’s-afflicted mother (Blythe Danner’s Ruth) goes missing during a snowstorm – with the movie detailing Bridget and Nicky’s subsequent efforts at convincing their father Burt (Robert Forster) to move Ruth into a nursing home. Chomko does an effective job of initially establishing the characters and the situation in which they find themselves, and it’s clear, too, that the writer/director has suffused the proceedings with authenticity that generally proves difficult to resist – with this especially true of the impressively believable chemistry between Swank and Shannon’s respective figures (ie they feel like genuine siblings). Chomko manages to avoid the staginess associated with stories of this ilk and instead cultivates an intimacy that’s awfully tough to resist. Despite the gravity of the situation, Chomko also cultivates some moments of levity that feels genuine. In “What They Had,” you laugh as much as you cry, and thanks to its strong ensemble, means you believe in the movie’s truth.